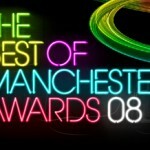 Hi lovely people I wanted to tell you about a competition that I felt all you lovely mums and dads should enter. 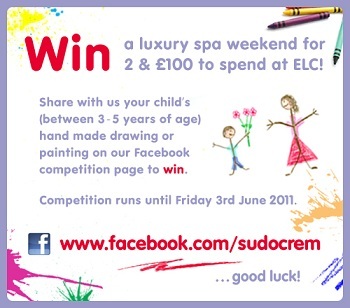 You can win a luxury weekend spa break in Chelsea, London at a 5 star hotel as well as £100 to spend at ELC! 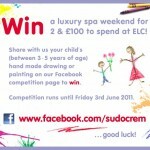 All you have to do is go to www.facebook.com/sudocrem , click the ‘CONTESTS’ link and then upload a piccie of your son or daughter’s best piece of artwork (have to be aged between 3 – 5 years old). Good luck.